Jupiter is the largest planet in our Solar System. Its mass is over 300 times the mass of the Earth. If you look at its atmosphere and over 20 moons, you could say that Jupiter is almost like another Sun. There is only one thing missing -- Heat. There is a magical time in a star's life when nuclear reactions start and the star begins to burn. Jupiter never got to that point. Jupiter is classified as a Jovian planet. The Jovian planets are gas giants that orbit the Sun. Gas giants don't have solid surfaces of rock like other planets. You will find some rock at the core of the planet, but it is very little when compared to the planet as a whole. As you move deeper into the planet, you find very dense gases that have become liquids. All of the Jovian planets are huge compared to the Earth but tiny when compared to the Sun. Jupiter has a diameter of 85,000 miles while Earth is only 7,600 (the Sun is about 870,000 miles). Jupiter is often one of the brightest objects in the sky because of its size. As you know, the bigger mass you have, the greater effect you have on the surrounding area. 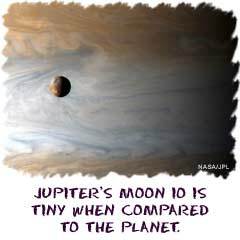 Well, Jupiter is huge. There is so much gravity and such a strong magnetic field that scientists discovered hydrogen gas in the outer atmosphere. No big deal. As you go deeper into the atmosphere the pressure and magnetic fields increase. Eventually you get to a layer where you find molecular hydrogen and finally liquid hydrogen right near the core of the planet. It takes an enormous amount of pressure to compress hydrogen into a liquid form. Just because a planet is big doesn't mean it can't have weather and storms like Earth. On Jupiter, the storms are as big as the Earth. When the Voyager probe flew by Jupiter in the 1970s, it took some great pictures of the huge storms that last for hundreds of years. Astronomers can see the swirling and the colored bands because of the different colored compounds in Jupiter's atmosphere. You'll find a lot of hydrogen, methane, and ammonia gas.